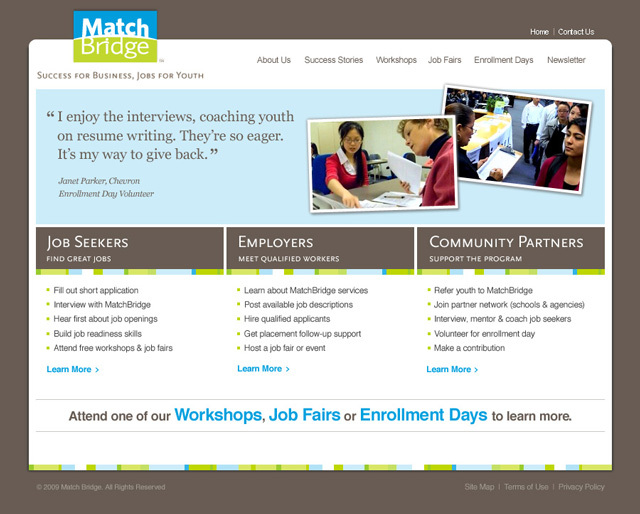 Jobs for Youth of Bay Area re-branded their name and logo to MatchBridge. Using their new brand I designed and developed their new website. The website uses WordPress as a CMS and is SEO and web standards compliant. I used outsourced development but did some front-end coding and all the flash myself. The website also uses WuFoo forms to help in their enrollment and recruitment process. MatchBridge is a project of the United Way Bay Area.